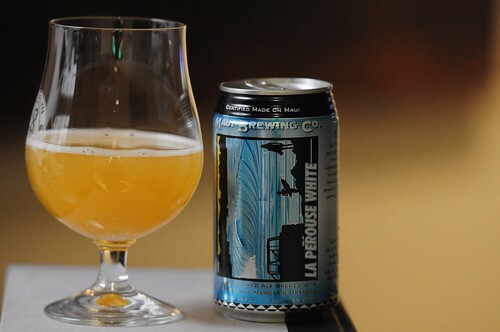 Maui Brewing La Perouse White, originally uploaded by adambarhan. S=Great nose on this one, refreshing summer notes. Very clean and crisp. You definitely get the mandarin orange. Coriander, and a bit of clove seem to be the most dominant. T= Clove and Coriander again are prominent. Mandarin gives way to balance it out, some sweet hay/grassy flavor comes through as well. I get a hint of banana on the back of the tounge as the beer warms. M=Great summer beer, This would be a nice intro for people who have not been craft beer drinkers in the past. O= A really, really good and refreshing witbeer. Stockup on this on before its gone. It will be great in the heat of the summer.